The book also examines what has been done to reform the financial and monetary systems since the worst of the crisis passed. "Are we now on a sustainable course?" Wolf asks. "The answer is no." He explains with great clarity why "further crises seem certain" and why the management of the eurozone in particular "guarantees a huge political crisis at some point in the future." Wolf provides far more ambitious and comprehensive plans for reform than any currently being implemented. 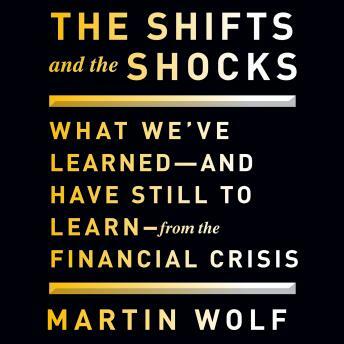 Written with all the intellectual command and trenchant judgment that have made Martin Wolf one of the world's most influential economic commentators, The Shifts and the Shocks matches impressive analysis with no-holds-barred criticism and persuasive prescription for a more stable future. It is a book no one with an interest in global affairs will want to neglect.